ZAMBOANGA CITY, Philippines (Mindanao Examiner / Mar. 11, 2011) – Executives of Sun Cellular on Friday announced plans to put up more cell sites in Mindanao Island and Sulu province in the southern Philippines as part of an aggressive expansion aimed at capturing a bigger share of the market in region. Sun Cellular, the corporate brand of Digitel Mobile Philippines, Inc., is the fastest growing mobile network provider in the country with more than 15 million subscribers and nearly 7,000 cell sites nationwide. Digitel, one of JG Summit’s core businesses focused on providing internet and telecommunications services, is part of the conglomerate which has business interests in air transportation, banking, food manufacturing, hotels, petrochemicals, power generation, publishing, real estate and property development. 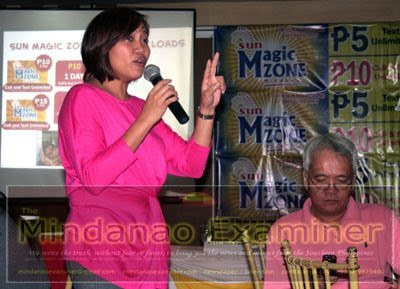 “We are working to expand our cell sites in Mindanao as part of our commitment to serve our growing demands in the southern Philippines,” lawyer Bill Pamintuan, Senior Vice President for Digitel, said at a news conference in Zamboanga City where they introduced the “Sun Magic Zone Mindanao,” which offers low price cell phone credit loads for unlimited voice call and text services on prepaid services. 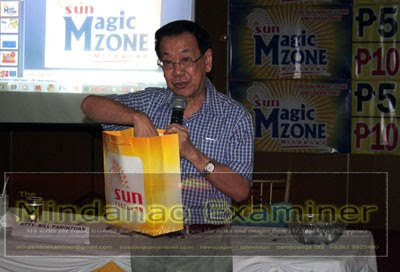 He said the Sun Magic Zone is exclusive for Mindanao only. He said before the end of this year, Mindanao will house more cell sites to provide wider network coverage and stronger signal within the island. “We are setting up additional 500 cell sites in Mindanao to provide reliable and affordable unlimited calls and texts, and broadband Internet services in the region,” he said. At present, there are some 500 cell sites across Mindanao. In Zamboanga Peninsula alone, there are at least 74 cell sites. One cell site is expected to be put up this year in Sulu to provide better cell phone services in the province.